Artha Forum recently had an event at the TIE Global Hall in Silicon Valley. 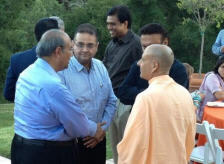 Hosted very generously by Mr Venk Shukla at the TIE Hall, and sponsored by Heritage Hotels, the program was attended by a motley group of TIE members, Silicon Valley entrepreneurs, industry leaders from the IT and Hospitality industry and family office executives, and was aimed at bringing the relevance of ancient wisdom literature to modern business . Some of the participants included Venk Shukla, President, TIE Global, Sushant Patnaik, Silicon Valley Entrepreneur, Ron Pitamber, CEO, Heritage Hotels Group, Rashmikant Kamdar, President, Rushab Ship International, Mr Anand Raja – Head Sales , Accion Labs,Mr Avinash Mishra, CEO Tech Endeavour, Mr Jagdish Amin, Director, Kony Solutions,Mr KL Venkatasubramanium,Group CFO RK SWAMY BBDO, Mr Kameshwar Eranki,CEO Vajrasoft,Mr Saurabh Tandon,Alpheas Advisors,Stuart Sender,Film maker. H.H. 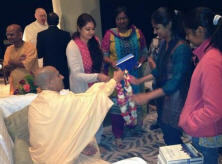 Radhanath Swami, spiritual leader, motivational speaker and author of international best-seller “The Journey Home” spoke for about two hours on the subject of wealth generation and ethics citing insightful examples on the responsibilities that come with wealth generation. The theme was ‘The Culture of Wealth.’ Wealth in ancient Vedic scriptures is considered as sacred and something that must be handled with utmost care and respect. With wealth creation, comes the responsibility to utilize the wealth and share it with others without greed and pride. When wealth is utilized in a selfish way it causes alienation from the goals of wealth creation. 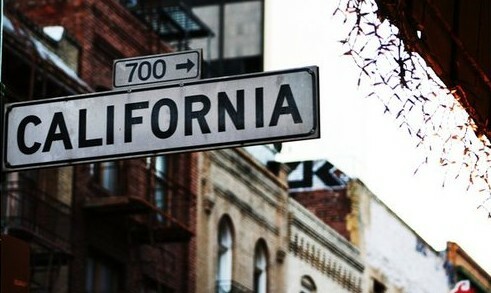 It causes disharmony, anxiety and unrest. When wealth is generated by ethical means, with responsibility and without being implicated in sin, it has an almost magical effect on the recipient and the beneficiaries of that wealth. Such wealth can be passed on from generation to generation without losing its sanctity. It was a memorable evening. 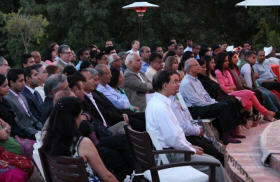 The event took place at the home of Silicon Valley entrepreneurs, Sushant and Namrata Patnaik in Saratoga, California. H.H. 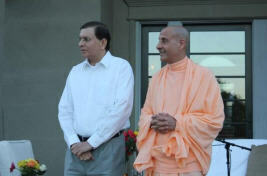 Radhanath Swami was accompanied by H.G. 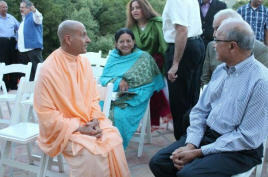 Vaisesika Prabhu, President, ISKCON San Jose and H.G. Shyama Sundara Prabhu. 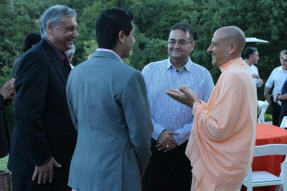 Some of the guests included Mr Nitin Mehta, Promoter & SVP Operations, Royal Viking Line, Mr K.B. Chandrashekhar, former Exodus CEO, Mr Damodar Reddy, CEO, SutiSoft, Mr Venk Shukla, President, TIE Global, Mr Ron Pitamber, CEO, Heritage Hotels Group and Mr Rashmikant Kamdar, President, Rushab Lines, to name a few. Western society is like an incredibly well built ship with no compass, and many people historically have turned to the East for that compass. The musk deer spends its entire life trying to find the intoxicating aroma of its musk gland, sometimes looking in thorny bushes and getting all cut up, sometimes crossing rivers and risking life, travelling and wandering trying to find it, and ultimately dies without realizing that what it is looking for is within itself. 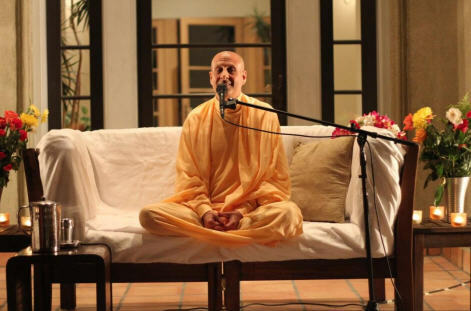 And this is the basic principle of the Bhagavad Gita and every scripture of the world – if we cannot find happiness, peace, love within ourselves, we can never find real fulfillment anywhere or in anything. In an evolved human society, people love people and they use things. If you want to know how rich you are, just find out how many things you have, that money cannot buy. Real wisdom is to see everything with equal vision, and when we have that enlightenment, the love within our heart we discover, it manifests as compassion towards others. Our responsibility is not just to market products, but to market culture and values along with the products. Because the way we do things, the dignity and integrity with which we do things is actually what we are giving to the next generation. That is the standard that they will consider sacred. Krishna did not tell Arjuna that you do not have to do your job, just meditate in the forest. If you are doing this for a divine purpose, you should be fighting with more enthusiasm, more determination and more creativity than anyone because you are not doing it out of greed. Love is a much greater power than selfishness. Love is the greatest power in the world. In our Society we have practices like the chanting of God’s name, the names of Krishna, to develop a foundation that we can really build our whole life upon.